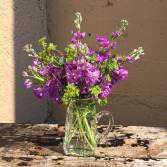 Fragrant purple stock and french buplureum in a glass pitcher vase. This one is farmhouse deco perfect. 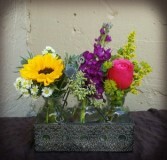 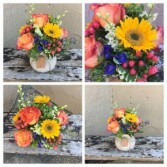 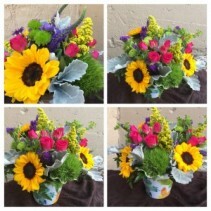 This posie vase has the best summer mix...garden roses, sunflowers, delphinium and hypericum berry. The glass vase is covered in a linen drawstring bag and tied with a wooden tag. 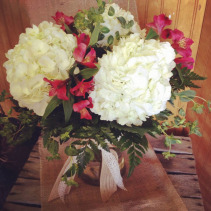 These tags are so cute with the recipient's name or initials. 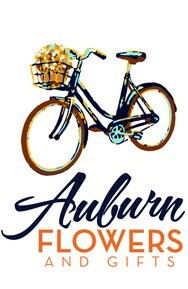 Let us know in the order notes if you would like something written. If not, it will be left blank and they can add their own accents. 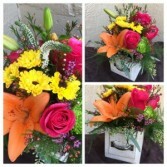 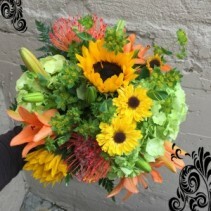 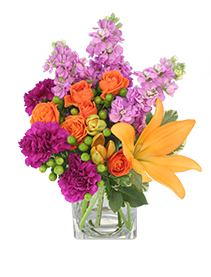 A combination of vibrant hues and sunlit warmth, this bouquet blossoms with love and gratitude! Pink roses and yellow Asiatic Lilies will capture your recipient's every attention, surrounded by alstromeria, snapdragons, bupleurum and lush greens. 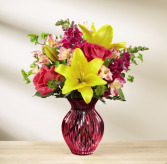 Presented in a keepsake raspberry pink glass vase to give this design a finishing touch.